Chincoteague Island holds some of my favorite foods. The fried chicken and barbecue from Woody’s, scallops from Gary Howard, and crabs and hushpuppies from the aptly named Crab Shack. Not to mention the multiple farmer’s markets, a donut truck, and various small bakeries and ice cream shops. It’s also the first place I discovered one of the tastiest regional specialties I have yet to try: Smith Island Cake. While they come in many flavors, the common theme among them is the towering number of individually baked (not split) layers, 8-14 of them as far as I’ve seen. 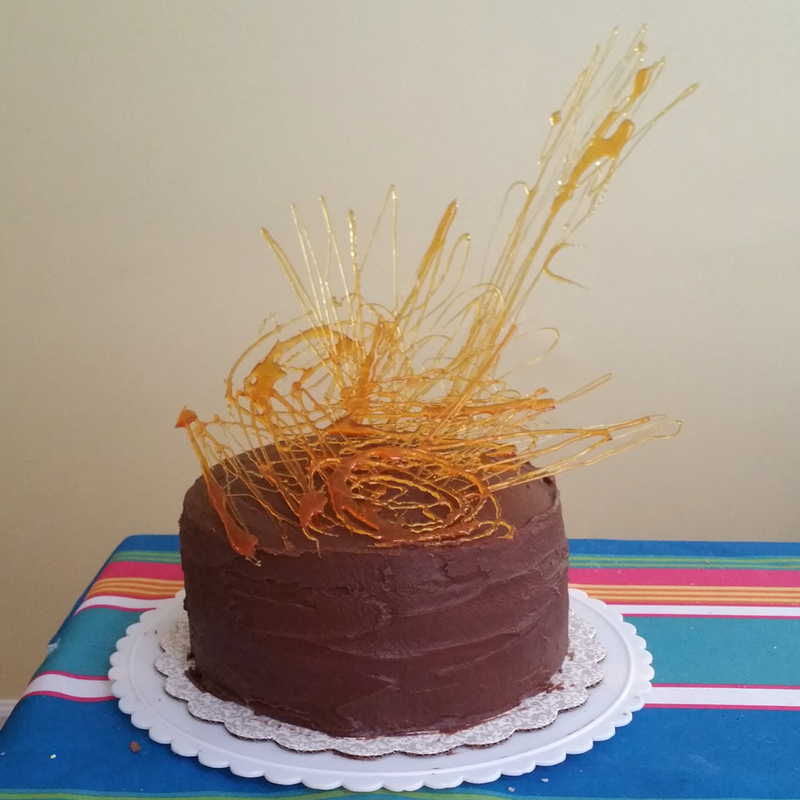 The cake is officially designated as the state dessert of Maryland and the most popular variety features a cooked chocolate fudge frosting (though my mother-in-law would have made a strong argument for the coconut variety that she LOVED). I shared a slice of one of these with my family on one perfect island day and it was a heavenly treat for sure. I’ve wanted to make one ever since, but kept putting it off because I just didn’t have the time. Then Joe went to Las Vegas for a weekend with his friends and I got bored, so things happened. I’ve done my best to streamline the baking method. The batter and frosting are both pretty simple, you won’t even need a mixer for anything, just two big bowls and a saucepan. No splitting of layers, hooray! And you can take your time with this. The cake batter and frosting are both resilient, so don’t stress. Cut 8 circles of parchment paper to fit the bottom of 9 in. round cake pans. Grease, line with parchment, and flour as many 9 in. round cake pans as you have. Test to see how many pans will fit on the middle rack of your oven. 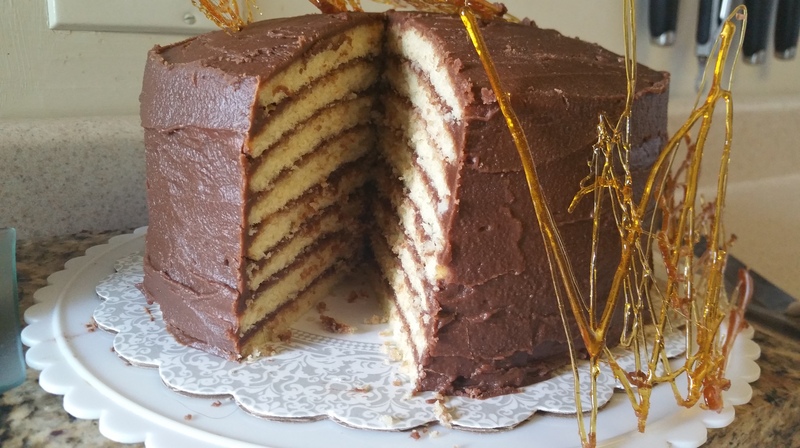 Doing this in advance will let you know how many batches you’ll be making for 8 layers of cake. I have 5 pans, so I baked in 3 batches. 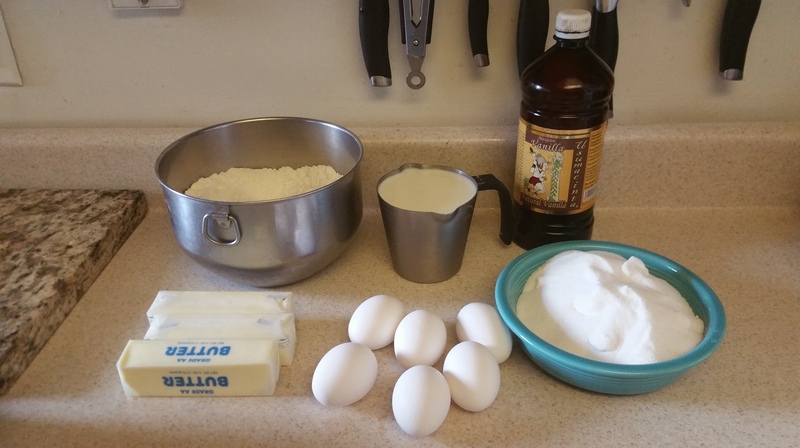 If you want to simplify dividing your batter among batches, weigh the bowl your final batter will be in. 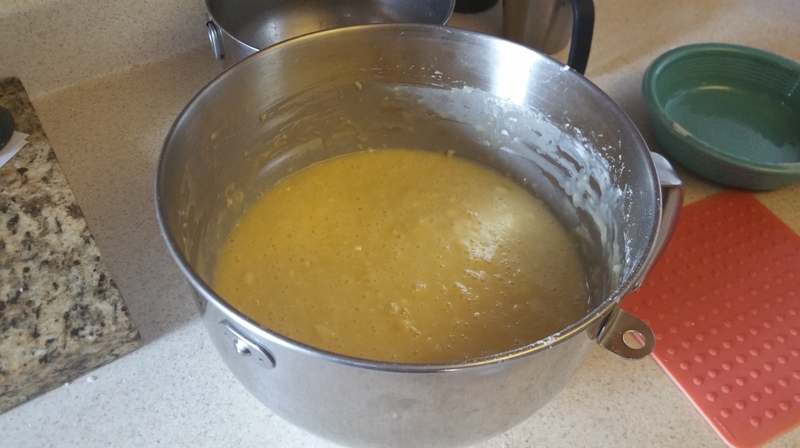 In a large bowl, mix the flour, salt, and baking powder. Set aside. 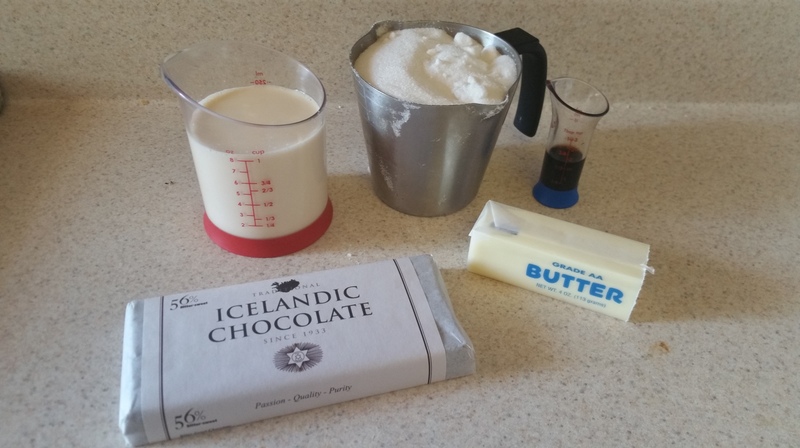 In another bowl, whisk together the butter, sugar, milk, vanilla extract, and eggs until well combined. 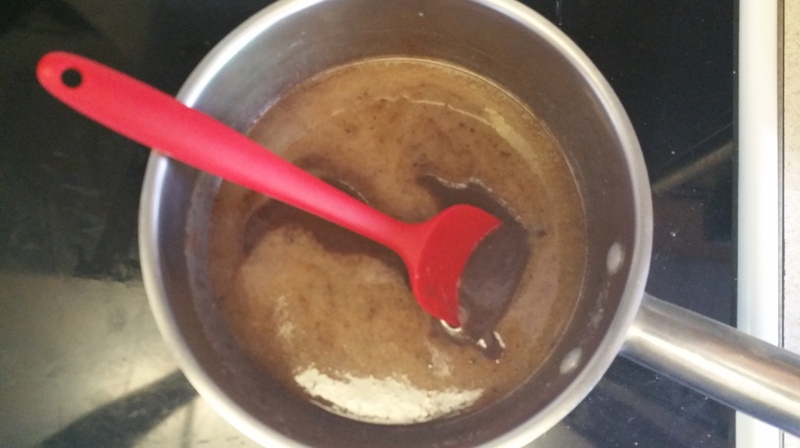 Pour the wet ingredients over the dry ingredients and whisk just until it comes together. It will look lumpy, like pancake batter. Let this rest for 15 minutes and then whisk until smooth. 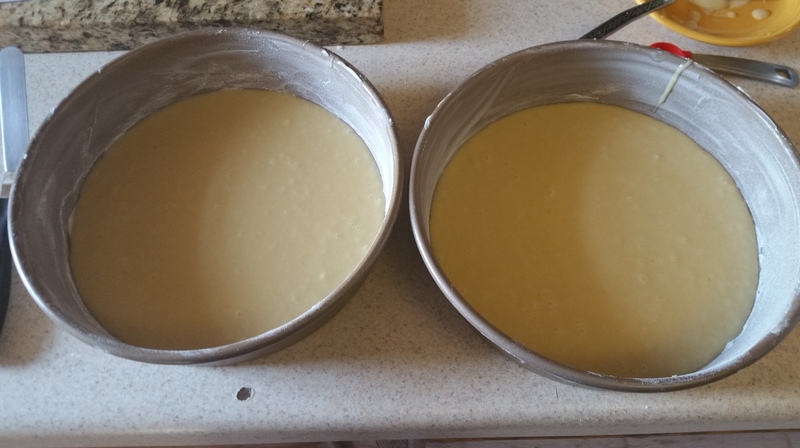 If you are going by weight, weigh your batter, subtract the weight of the bowl, and then divide by 8 to get the amount of batter you’ll use per pan. 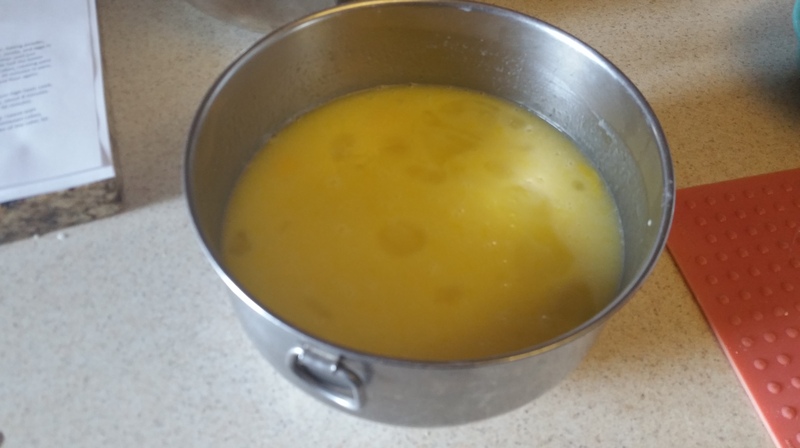 Alternatively, put a clean bowl on the scale, use the tare function, and pour the batter into the clean bowl. Then divide that number by 8. For my batter, this worked out to just under 9 oz. 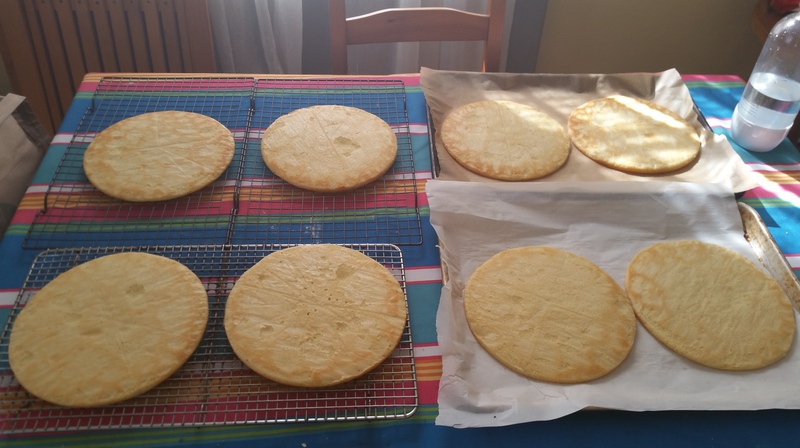 per pan. I would say it was a heavy ¾ cup per pan. 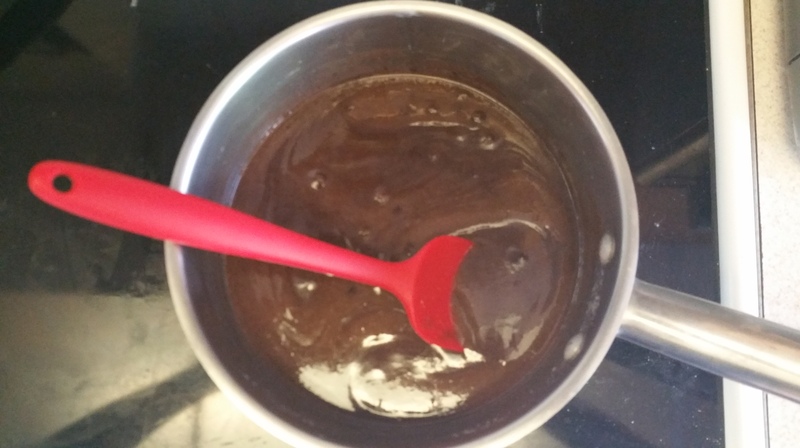 Spoon the batter into the prepared pans and then tilt the pans to spread the batter evenly across the bottoms. Bake the layers for 15 minutes or until just golden at the edges and pulling away from the pan. Allow the layers to cool in pans for 5 minutes, and then invert onto wire racks to cool completely. I don’t have enough cooling racks for 8 cakes, but these cool fast and you can move the cooled layers onto parchment to give yourself more real estate when the next batch is coming out. 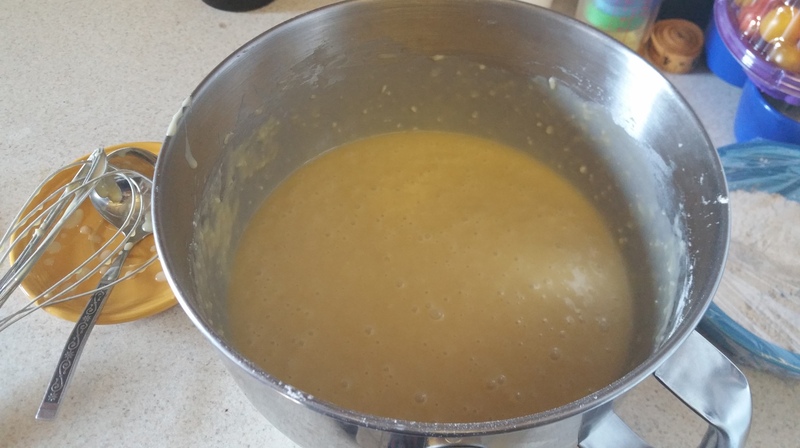 Re-grease and flour pans as needed, divide batter, and bake until you have made eight layers. 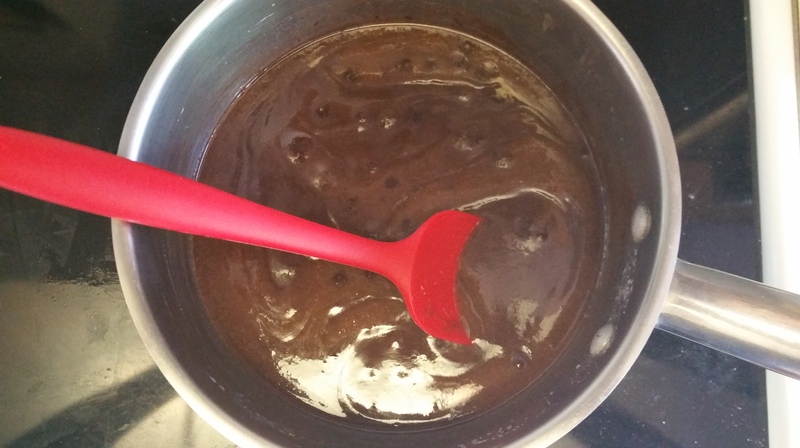 To make the fudge frosting, combine the butter, evaporated milk, chocolate, and sugar in a saucepan over medium high heat, stirring often. 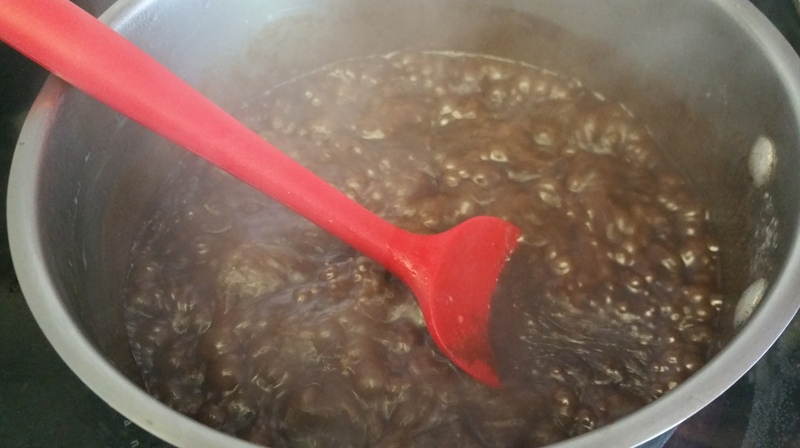 Boil the mixture, stirring, until thick and shiny (about 8 minutes). It should coat the back of a spoon well. Set aside to cool for about one hour, or until warm, but spreadable. To assemble the cake, spread a thin layer of frosting over each layer. As you stack, the frosting will start to set up and keep things pretty stable. 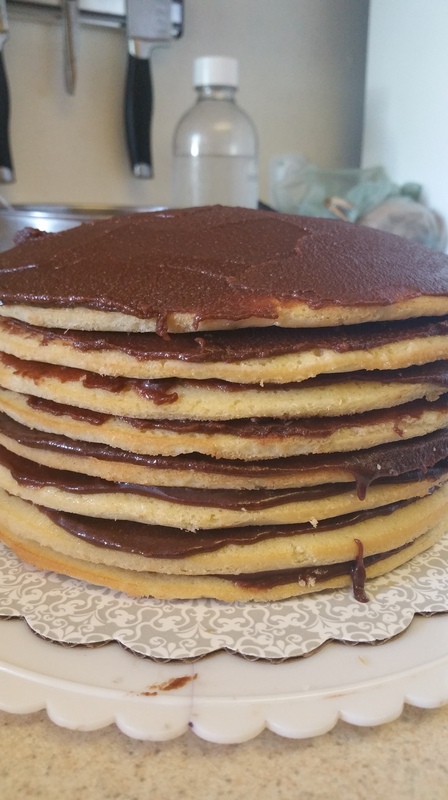 Once you have stacked all 8 layers, spread the remaining frosting along the sides and top of the cake. 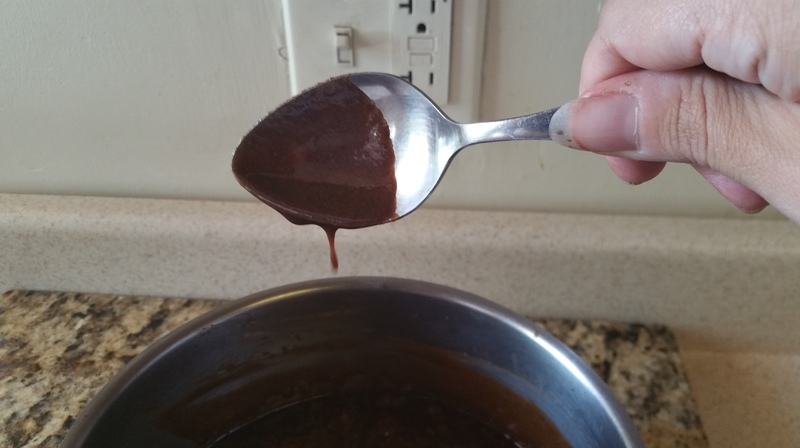 If it starts to get too stiff, just re-warm it a little and it will become spreadable again. Like I said before, super resilient stuff to work with. Yes, perfect, clean layers! So satisfying. So what’s the cake like? 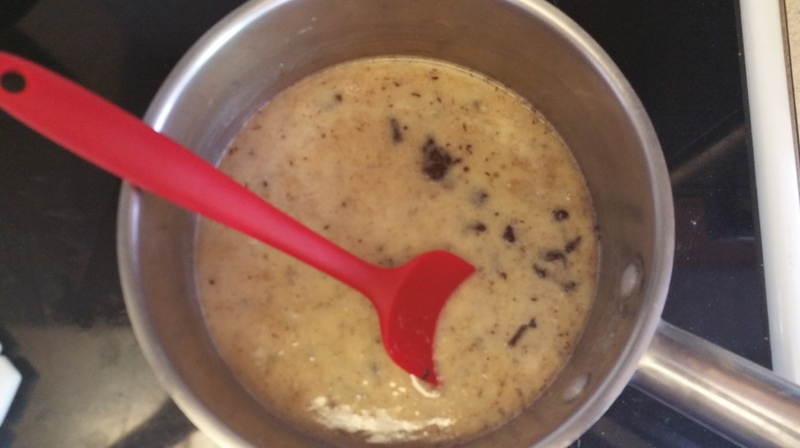 It has a buttery soft texture and a warm vanilla flavor. The fudge frosting is something special. 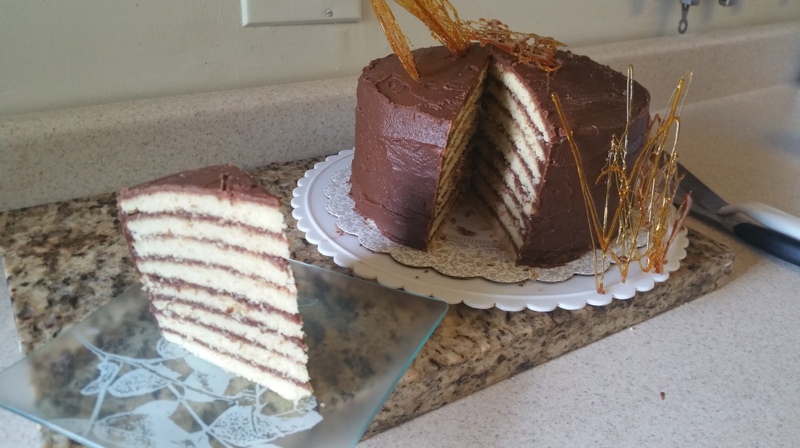 I love how it sets up and makes this cake so easy to slice. The flavor is a decadent, rich chocolate that’s, well, wonderfully fudgy! I know the baking in batches is a bit time consuming, but this cake is so easy to put together once that’s done. And so very worthy of state dessert status! Don’t be afraid to be creative. 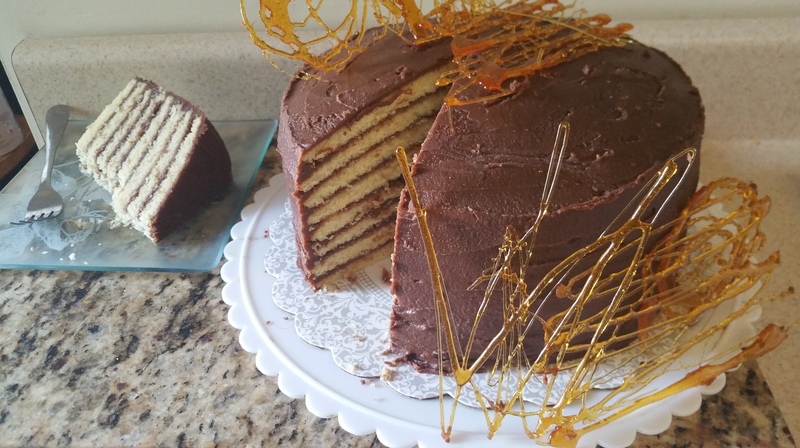 You can certainly make some vanilla fudge frosting or a double recipe of maple buttercream, peanut butter filling, or caramel sauce to sandwich between the layers. Jam or curd might be a bit slippery unless you let the layers sit in the fridge between stacking/filling, but the cherry filling from the Ribbon Cake is definitely thick enough to hold up here. You could really make some fantastic stripes, in fact I’m already dreaming about my next birthday cake.